Steppe. A term, originally applied to the natural grasslands of Southern Ukraine, which has been generalized to designate any natural grassland plain with a temperate, semiarid climate and chornozem or chestnut soils. The Ukrainian steppe encompasses most of the western segment of the Eurasian steppe that is known as the Black Sea (or Pontic) steppe province. The province forms a wedge, delimited by the forested foothills of the Crimean Mountains and the Caucasus Mountains in the south, the forest-steppe zone to the northwest, and the drier, more continental steppes east of the Volga River. The border between the forest-steppe and the steppe is not distinct, but may be defined by the line Cahul–Tyraspil–Kropyvnytskyi–Krasnohrad–Balakliia–Valuiky–Buturlynivka–Atkarsk–Samara. The steppe thus occupies about 240,000 sq km (40 percent) of Ukraine, nearly 300,000 sq km (40 percent) of the compact Ukrainian ethnographic territory, and 460,000 sq km (48 percent) of both compact and mixed Ukrainian national territory. The steppe, endowed with the greatest heat resources in Ukraine, has the longest growing season, but receives the least precipitation and often suffers from drought. The mean January temperatures range from –2°C along the Black Sea coast to –10°C (Buturlynivka); the mean July temperatures are from 20°C in the north to 24°C in the eastern Stavropol region. The frost-free period ranges from 220 days in the southwest to 150 days in the northeast. The annual accumulation of degree-days above 10°C increases southward from 2,800 to 3,600, and the growing season increases from 210 to 245 days. The relatively moderate southern climate allows for the cultivation of heat-loving crops, relay cropping, and even double cropping. The annual precipitation, however, decreases southward from 450 mm along the forest-steppe margin to 300 mm at Perekop. The moisture deficit, generated by an average annual evaporation of 900–1,000 mm, is in part compensated for by an early summer precipitation maximum (when the plants need more water). Moisture accumulation in the soil is unstable, however, for the meager winter snow accumulation is often removed by thaws. The small rivers in the steppe tend to be seasonal and to dry up in the summer. The large rivers, such as the Dnieper River and the Boh River, carry their water in transit. The small lakes, often in pody, are seasonal; the large lakes are of the coastal, liman type, many with saline water. The Ukrainian steppe is frequently differentiated according to climatic and soil conditions into three subzones, the northern steppe, the middle steppe, and the southern steppe. The northern subzone is characterized by a natural vegetation of meadow fescue and feather grass on ordinary, medium humus content (6–8 percent) chornozems. Its natural vegetation consisted of a luxuriant growth of tight-turfed, narrow-leaved grasses (such as feather grass and fescue), forbs (such as drooping sage, veronica, campion, steppe tulips), and shrubs (blackthorn, almond, steppe almond). The sandy river terraces were covered with pine forests. 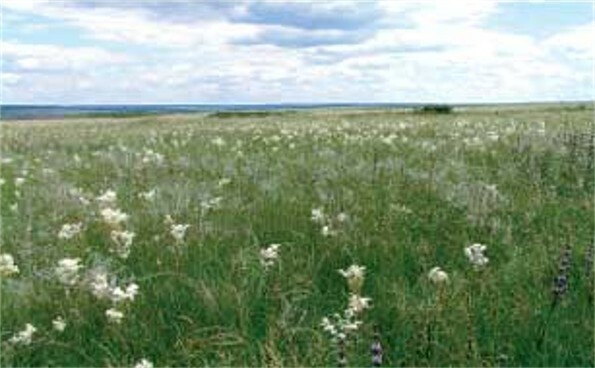 Some of the natural vegetation is preserved in the Luhansk Nature Reserve and the Ukrainian Steppe Nature Reserve. 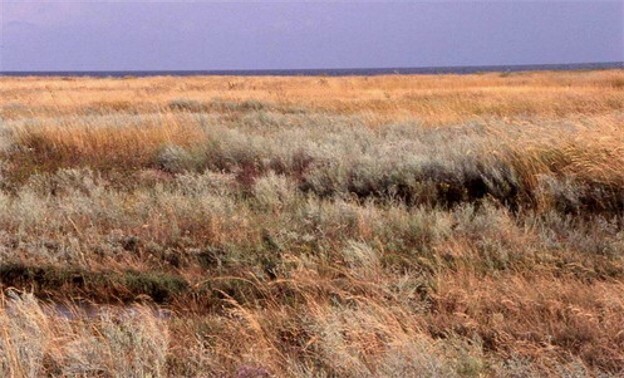 The middle steppe, extending along the Black Sea coastal plain eastward toward the northern coast of the Sea of Azov, is characterized by narrow-leaved fescue and feather grass on southern chornozems (5–6 percent humus content) and dark chestnut soils (3–4 percent humus content). Its vegetation, dominated by narrow-leaved Xerophytic grasses (such as feather grass, esparto grass, and several fescue grasses) with an admixture of Xerophytic forbs (such as limonium) and spring ephemerals, is preserved in the Askaniia-Nova Biosphere Reserve. 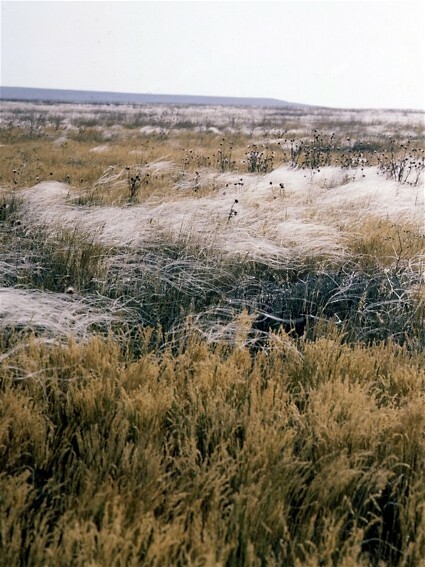 The southern steppe, which straddles Perekop Bay and Syvash Lake, consists of dry wormwood-grassland steppe on chestnut and solonetz soils (2–3 percent humus content). 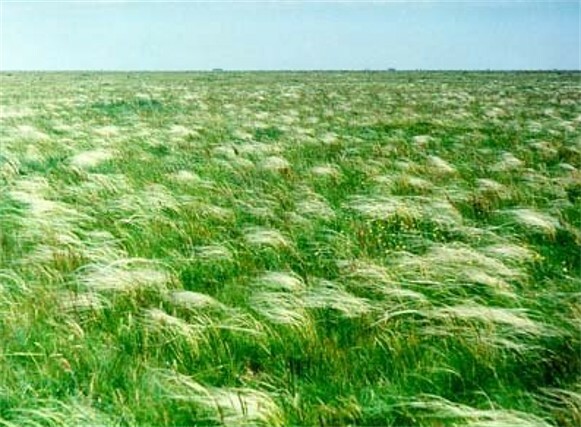 The vegetation, containing wheat grass and fescue grass and occasionally esparto grass and several sages, is preserved in the Azov-Syvash Game Preserve. The present fauna of the steppe is dominated by soil-boring rodents, who find sanctuary from inclement weather underground, and by their predators. Among the rodents are rabbits, marmots, hamsters, mice, and European mole rats; the predators are the polecat, the fox, and the wolf. Bird species include lark, quail, yellow bunting, partridge, windhover, and, less commonly, little and great bustard, owl, and eagle. The Ukrainian steppe has been almost completely modified by human activity. Of the total land area in the steppe zone of Ukraine (1981), 64.9 percent is cultivated, 2.4 percent is under perennial plantings, 0.8 percent is hayfields, 10.8 percent is pastures, 4.2 percent is woodland (mostly riverbank and shelterbelt plantings), and the remaining 16.9 percent is devoted to other uses. Grains occupy one-half of the cropped area, among which winter wheat is prevalent. Among industrial crops sunflower and to a lesser degree sugar beets in the northeast and the Kuban are important. Heat-loving melons and vegetables such as tomatoes are produced in the Donbas, near Kherson, and near Odesa (in part for consumption in the northern cities). Vineyards are particularly common west of Odesa, near Kherson, and in the Crimea. Livestock densities are not high, but sheep are dominant on the dry pastures of the southern steppe. Moisture deficit, drought, and frequent sukhovii and dust storms have hindered agricultural production. Attempts to counter such climatic hazards have included shelterbelt afforestation and irrigation as well as the melioration of salinized soils following improper or careless irrigation.